Want to add rigor and fun to your learning environment! 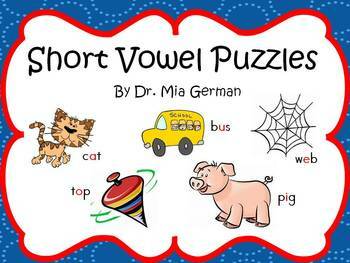 Short vowel puzzles are an instructional tool that promotes problem solving, critical thinking, and will engage all learners. When you purchase this item you will get a puzzle for each of the vowels, ă, ĕ, ĭ, ŏ, ŭ. 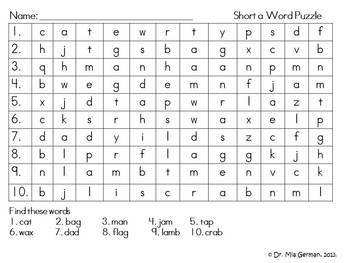 Each puzzle contains 10 short vowel words that the child will have to find in the puzzle. This resource is a great literacy center or homework activity that is guaranteed to be a classroom favorite. Most students love to do puzzles and won’t even realizing that they are identifying, spelling, reading, and sounding out short vowel words while they are completing this resource. Thank you in advance for your purchase and positive feedback! Visit my store for more instructional products that will surely enrich your learning environment!